Potassium, the most abundant cation in the human body, regulates intracellular enzyme function and neuromuscular tissue excitability. Serum potassium is normally maintained within the narrow range of 3.5 to 5.5 mEq/L. The intracellular-extracellular potassium ratio (Kj/Ke) largely determines neuromuscular tissue excitability . Because only a small portion of potassium is extracellular, neuromuscular tissue excitability is markedly affected by small changes in extracellular potassium. Thus, the body has developed elaborate regulatory mechanisms to maintain potassium homeostasis. Because dietary potassium intake is sporadic and it cannot be rapidly excreted renally, short-term potassium homeostasis occurs via trans-cellular potassium shifts . Ultimately, long-term maintenance of potassium balance depends on renal excretion of ingested potassium. 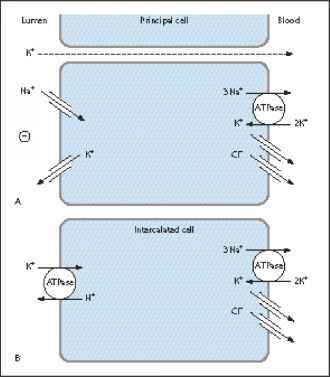 The illustrations in this chapter review normal transcellular potassium homeostasis as well as mechanisms of renal potassium excretion. With an understanding of normal potassium balance, disorders of potassium metabolism can be grouped into those that are due to altered intake, altered excretion, and abnormal transcellular distribution. The diagnostic algorithms that follow allow the reader to limit the potential causes of hyperkalemia and hypokalemia and to reach a diagnosis as efficiently as possible. Finally, clinical manifestations of disorders of potassium metabolism are reviewed, and treatment algorithms for hypokalemia and hyperkalemia are offered. syndrome, is caused by a mutation in an ion cotransporter in a completely different segment of the renal tubule . The genetic mutations responsible for hypokalemia in the syndrome of apparent mineralocorticoid excess  and glucocorticoid-remediable aldosteronism  have recently been elucidated and are illustrated below.